When I traveled in Turkey last year, local people said pomegranate is their famous fruits. They said that pomegranate has lots of nutrients for medical properties, fighting cancer, losing weights, and anti-inflammatory effects. Besides, this fruit also benefits our skin like helping moisturize dry skin, combats inflammation from acne breakout, protects our bodies against the sun and environment, and stimulates collagen production. 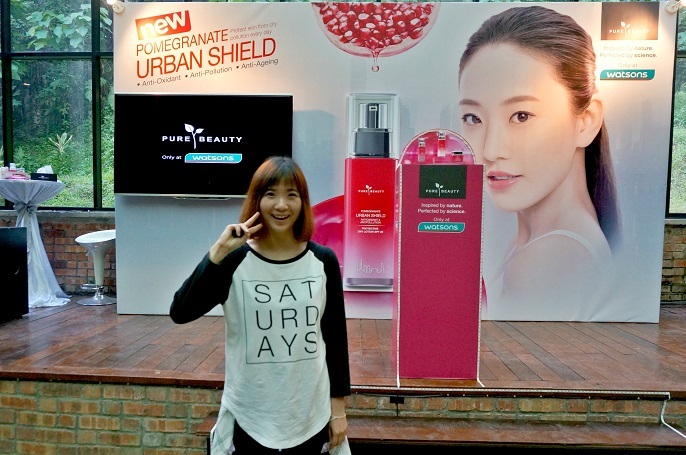 And, today Pure beauty, a Korean skin care brand has launched a powerful new skin care line, Pomegranate Urban Shield for Antioxidant and Anti-pollution, by using fermented pomegranate extract to hydrate skin and even out skins tone. 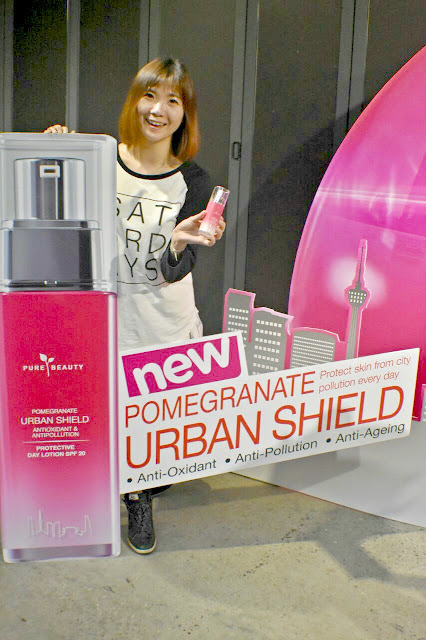 The Pure Beauty Pomegranate Urban Shield is a perfect solution for the busy woman who has tired skin and bad complexion due to the environment surrounding. Nowadays, the environment and pollution that we have everyday is certainly no matter how, so it is important to have a skin care range to protect our skin, strengthen the skin barrier and boost our skin against the pollution. Pure Beauty Pomegranate Urban Shield helps to revitalize, soothe and protect the skin while also helps reinforce the skin's natural defenses against external aggression. If you notice well, Pomegranate Urban Shield has a brand new packaging for this range, and also upgraded the formula with best of natural ingredients and latest technologies and science. The skin care range comprises of fermented Pomegranate extract, Urban Shield Complex, Swiss Radicare, Bulgarian Rose Water and certified organic ingredient. All these upgraded ingredients help to strengthen the skin barrier, revitalizes dull skin and reveals natural radiance, anti-aging,and anti-pollution. For me, to have a good skin is not only going bed early, and drinking plenty of water; it is also very important to get the right skin care to protect my skin. The very first thing that I can't skip daily is the sunscreen because it offers more protection from the harmful sun, followed by a reliable skin care product which helps to protect from oxidation damage and avoid signs of aging. I believe a youthful looking skin is all the woman wants, don't you think so?! 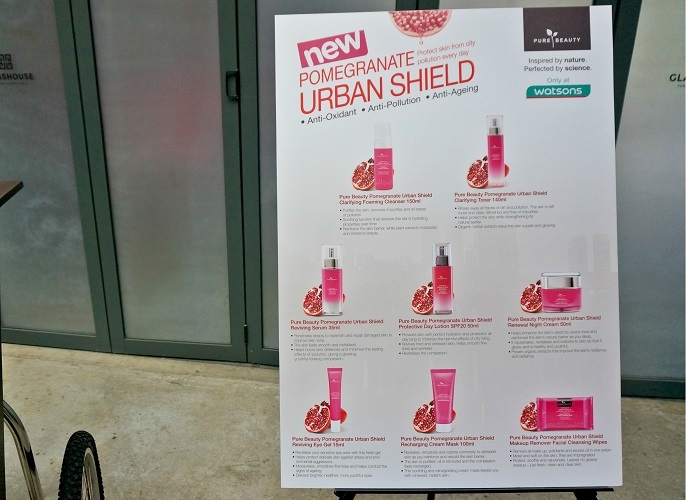 The Pure Beauty Pomegranate Urban Shield use the advanced skincare technology on their latest range. They all are made in Korea with dermatologist tested, so it is effective and safe to use. The most important thing is the pricing is affordable to everyone, whereby it is ranging from RM20 to RM65 per item. The complete new range includes Clarifying Foaming Cleanser or Mousse, Clarifying Toner, Reviving Serum, Protective Day Lotion SPF20, Renewal Night Cream,Reviving Eye Gel, and Recharging Cream-Mask, and Makeup Remover Facial Cleansing Wipes. So, where to get them? They all are available at any Watsons stores in Malaysia now!